I write this, wishing you all a very happy Easter. We, in Manus, send our love and prayers to all of the people around the world and especially our beloved families and friends in Australia. May God bless all of us by fulfilling our hopes and dreams. This is the 6th Easter we are celebrating since we were forcibly transferred from Australia to Manus Island. Every Easter I have said to myself that next Easter will be happier, and I’ll be free. But here I am, still on Manus, still desperately waiting for my release and freedom. Yes, waiting through another Easter, the same as the Easter when we experienced the PNG Navy shooting towards us. In 2017 Good Friday became a bad Friday for us. It was a day filled with fear, trauma and powerlessness as the PNG Navy shot at us for about 60 minutes. Highly sophisticated guns were used. We had no protection. We were left imprisoned and abandoned. We didn’t know what to do, where to go or from whom to seek safety. Instead of the security guards protecting us they ran away from us and hid. The former Immigration Minister, now Minister for Home Affairs, Peter Dutton, publicly accused us of creating this situation, saying that it was our fault that the shooting happened. 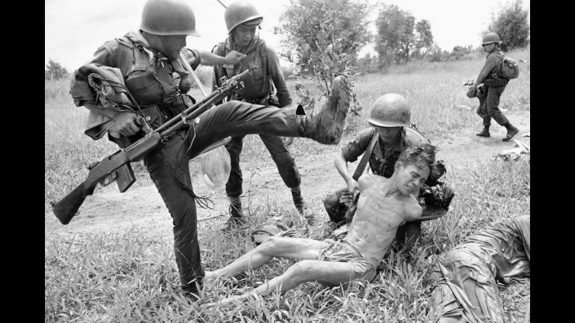 But like many times before, we had done nothing wrong. Mr Dutton’s power and use of words that represent us as criminals or terrorists seemed to produce enough doubt in much of the Australian people’s minds so that these terrifying criminal acts against us were not seen as serious, or even as acts of crime against human beings. Minister Dutton euthanised out any truth. Instead of enquiries and investigations he accused the victims of this tragedy. His explanation and the stories created about this terrible day were the actions of an irresponsible man without any integrity. The PNG police commander for Manus Province, however, denied Dutton’s allegations and stood by justice. Having survived this shooting of 2017, we realised that again we were just lucky enough to be alive. We fled our family and home country to escape being tortured, persecuted and eventually killed but here we were experiencing the same treatment. It’s been almost three years since this tragic violence was visited against us and still, we are here in this remote island with no hope, desperately waiting for our freedom. A few weeks ago, I wrote of how the food ration that the men in Hillside camp receive has been reduced and the quality of the food is considerably less than what is at the lowest scale of acceptable for humans. Not only is the food not nurturing, sometimes obviously dangerous, and the amount not enough, but the men in Hillside camp have not been given adequate sanitation and the toilets are not being cleaned properly. 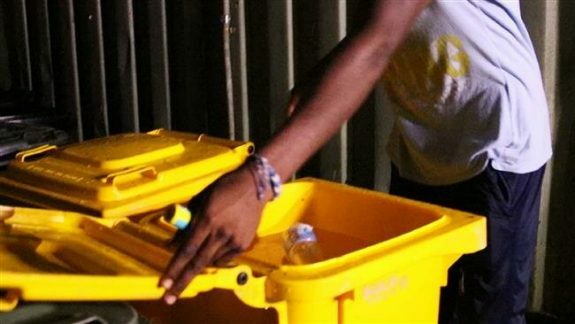 Now, two men in the Hillside camp on Manus Island have been diagnosed with Typhoid Fever. Poor sanitation, contaminated water and food are some of the main factors responsible for typhoid. Each of these factors are present in Hillside. Unhealthy diets, including uncooked food and reheated food, unclean water, the damaging effects of being detained that affect our immune systems, and the accumulation of toxins in our bodies that have resulted from the unhealthy life-styles forced upon us, make it difficult for us to fight typhoid fever which is easily spread in a prison camp environment. After the two men were diagnosed with Typhoid fever were flown to Port Moresby. A maintenance team was bought in to clean their rooms with the aim of stopping the virus from spreading. A man who shared the room with one of the infected men was taken to Pacific International Hospital (PIH) Clinic on Manus Island for a medical checkup but was sent back to camp without any medical checkup. The PIH is contracted by the Australian government and runs a basic, ill-equipped clinic on Manus Island, offering even more inferior health care than was available to us in the past years. This clinic for refugees does not have the capacity to treat sick men. When someone is sick and needs anything other than basic first aid, let alone to be isolated and kept in an intensive care unit, the PIH send the sick man to Lorengau local hospital where there are very limited facilities. The local hospital is overwhelmingly overcrowded, so much so that even one patient adds more pressure and trouble than the local community can hold. To send the sick refugees to Port Moresby where the PIH is, requires various approvals from the authorities. This practice of requiring various approvals of course takes time and can be dangerous, as we have seen with our friend Hamed who died because of the delay by authorities of approvals to move him to a hospital that could treat his infection. This outbreak of Typhoid fever is worrying us all. The two ill men have been sent to the PIH in Port Moresby, but the local staff need to be given proper medical checkups as do the refugees. Most of the men and staff are not being given enough information on how to prevent this kind of disease from spreading. Keeping men confined in camps lacking basic hygiene, quality food and depriving them of appropriate medical support can easily lead to this situation. There is an answer to preventing the further spread of such a disease. There is an answer to ending the exacerbation of trauma. It is well over time for the camps to be closed. 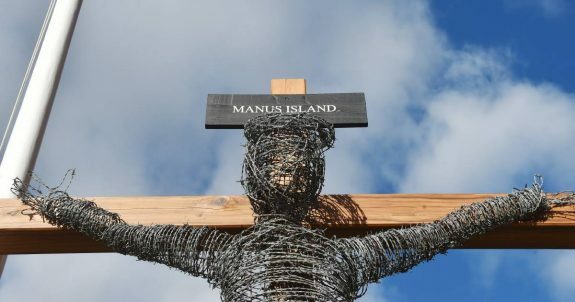 On this Easter Good Friday I’m calling the Australian people to call their politicians to account for the ongoing violence against us and to bring an end to this devastating policy enacted by your name. Much has been written about climate change in recent years. There seems to be a belief by some that it is possible to argue both sides of the debate, that both sides have great merit in their positions. What I present here are many attempts to downplay the reality of Climate Change in the mainstream media (MSM) and the way in which that position is an incoherent muddle of misinformation and contradiction. I add some science derived from Tony Eggleton in his book “A short introduction to Climate Change” (Cambridge UP, 2013). Ian Plimer, “Repeat after me: Carbon dioxide is good for you” (7/8/18). future climate can be predicted by computer models. There is no connection between temperature and CO2 emissions, but there is between solar activity and temperature. Climate models over the past 30 years did not predict what actually happened because they assume that CO2 had the pivotal role. Sun and orbit, he says, drive climate change. In fact, we might ask why do we reduce any emissions at all if, as he claims, CO2 has nothing to do with climate change? Giles Auty, in “Rainy Day Notes” (7/12/18), quotes from Plimer’s “Heaven+Earth: Global Warming – The Missing Science”. Tony Abbott has spoken of belief in global warming in terms of sacrificing goats to appease the gods. More recently he has flipped on his demand to leave the Paris Agreement. Not quite so sure now? Just political expediency? John Howard has said he is an ‘agnostic’ with regard to global warming. He is more certain about his belief in ‘traditional’ methods of creating electricity – by which he no doubt means coal. 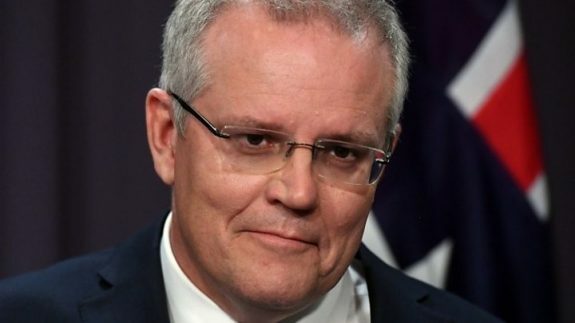 But the religious word ‘agnostic’ is interesting, the use of coal is primitive – and as PM of Australia he should have had a better access to information. But his “agnosticism” gets in the way – or is it ideology? Another person who should have had plenty of access to climate change information and who claims to be “agnostic” is Maurice Newman. But then he might have had closer association with actual deniers. He said, April 22, 2014, “…t here is no empirical evidence that man-made CO2, man-made emissions are adding to the temperature on earth. We have not had any measurable increase in temperature on earth in the last 17.5 years… no evidence that CO2 has driven climate change either… because Mother Nature is not complying”. Already, we see some contradiction arising – there has been warming, but not now, he says. Newman remains “agnostic”. “While CO2 may be a greenhouse gas, it seems that natural forces dominate climate change, not mankind’s emissions. Henrik Svenmark’s Theory of Cosmoclimatology (the role of cosmic rays) might be right”. So he is willing to believe Svensmark’s catechism, but not the IPPC’s, because Svensmark’s avoids blaming the burning of fossil fuels. Yet there is this concession that “CO2 may be a greenhouse gas”. But already in Feb, 2012, Svensmark had been “guest author” in a book called “Die kalte Sonne” (The cold sun) which espoused that ‘global warming over the past 150 years is part of a natural cycle that is characterised primarily by the sun”. According to some sources (such as Zeit Online) the book contains numerous fallacies… these fallacies include the book’s claims that the Earth has not warmed since 1998, that the Hockey Stick graph was a hoax, that only the sun is to blame for global warming, that the IPPC has manipulated climate science, and that we are entering a period of global cooling due to solar activity”. Newman seems to have bet on the wrong horse. 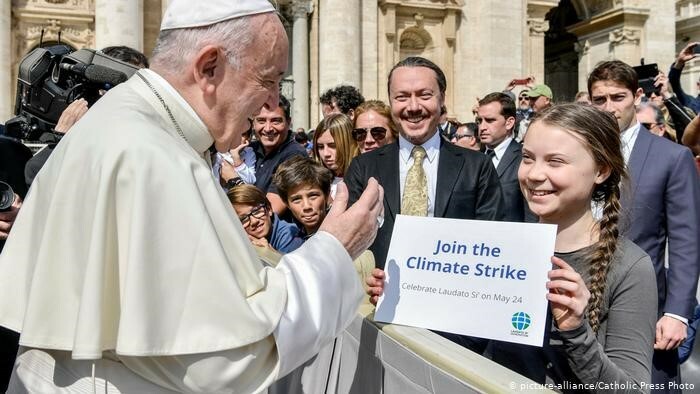 Perhaps he, too, has vested interests (an accusation he levels at IPPC scientists when he said, July 3, 2013, “… the science of human-caused climate change is a smokescreen for vested interests”). (Source: desmogblog.com and see Eggleton, 2013, pp.34-35 re sun spots and re Svensmark). For these people, climate change/global warming is merely something you believe in or you don’t. If you believe, they say, it is a primitive religion; if you do not believe, you must be a highly sophisticated scientist – or some such thing. Another scientist who has criticised the IPCC stance on Climate Change was the late Bob Carter writing in his book “Taxing Air: Facts and Fallacies about Climate Change” (2011). The fatuous title, the cartoons and the Credlin confession that Gillard’s carbon ‘tax’ was not a tax reveal a great deal. Carter tells us that CO2 is a ‘greenhouse gas’ and Greenhouse gases play a key role on controlling temperature (p 90). But then he goes on to say that the more CO2 there is, the less effective it is. He claims this according to a “projection, using the MODTRAN standard atmospheric model (University of Chicago). All of which is very interesting because Carter contradicts Plimer on both counts: CO2 as a greenhouse gas and the failures of computer driven climate models. Another writer on things climate change is Jo Nova at joannenova.com.au: “Townsville flood maps reviewed as more houses go under”. “The local Government Guru must be flummoxed. He (Hallam) even protests they used the ‘Monte Carlo’ risk analysis ‘as recommended in 2012 by experts’. What could possibly go wrong? She goes on to recommend a certain “Assessing Climate Change under Uncertainty: a Monte Carlo Approach” by Jeeyoung Park, submitted “in partial fulfilment of the requirement for the Master of Environmental management degree at Duke University, 2008. Remember that Plimer said climate change cannot be predicted by computer models. And that carbon dioxide has nothing to do with global warming. He is contradicted by Bob Carter with regard to carbon dioxide and computer modelling. Jo Nova speaks about a ‘one hundred times more powerful computer model to do the job. Note also how her modelling is to rescue a highly profitable economy. Yet Nova has also been very sceptical of computer modelling [Eggleton p. 181]. Perhaps it is the economy which needs to be changed. Perhaps it is the economy which is wrong, not the IPCC science. The Townsville floods of a year’s rainfall falling in a week is an extraordinary event. Around the world people are seeing weather events of magnitude and power they have never seen before. And as for the Park computer model, “one hundred times more complex’, have we seen it at work at all? And if it is our coal-driven economy is the cause of Anthropogenic Global Warming, is that economy worth saving or are humans bound to find another way? “Weather has always been wild: don’t assume it’s part of a trend” as a by-line for his article “Latest forecasts: Climate of fear” (2/9-10/2019). 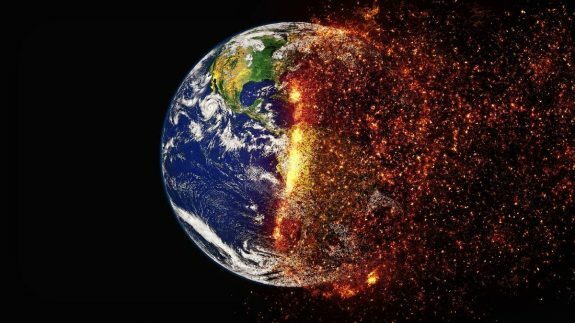 “Based on current assessments of the science, man-made climate change is not an existential threat on the timescale of the C21st, even in its most alarming incarnation. If we believe the climate models, any changes in extreme weather events would not be evident until late in the C21st. The greatest impacts will be felt in the C22nd and beyond. “Vulnerability”? So that is the problem, not climate change and extreme events per se. She might very well have mentioned Australia as well – and all the world, perhaps? But has it really? Is there something different about the present global warming? Something about the rate of change – far different from Curry’s predictions of far off consequences? Are we not seeing consequences now? “New technologies”? Unfortunately, if she is not referring to renewables, it is a pipe dream which kicks the problem down the road and offers no solution at all. It is of the Bjorn Lomborg kind which also tells us that climate change is real, that we cannot afford to reduce emissions but we could tackle other priorities such as TB and malaria until some technological solution arises to tackle climate change! What Marohasy means by “cycles” is not clear, something about understanding “relationships in historical data”. Sounds like pie in the sky wishful thinking that such cycles exist, created in her own mind already without the aid of artificial intelligence. No examples are given, of course. She is merely trying to avoid blaming carbon dioxide as the culprit and instead proposes some arcane blend of cycles, such as orbits, Milankovic cycles, the carbon cycle, the sunspot cycle, Earth rotation, perhaps…anything but carbon dioxide? What we see is how deniers are not able to compile a coherent denier science about the origins of Climate Change and frequently contradict each other and themselves. Which explains why the Murdoch media publishes denier nonsense daily to comfort its adherents. “used to write editorials… former Rhodes Scholar, volunteer lifesaver … (is being regarded as) a poor local member because of his position on climate change”. Now there we have indeed a bit of ‘identity politics’ and ‘virtue signalling’ (favorite Murdoch phrases). The former PM, known for his poor judgement and sacked by his Party, is criticised for his view of climate change, on which he has recently flipped? Nothing about the lies, the lack of judgement, the wrecking of the NBN … and the sniping and treachery exhibited from the back bench in his bid to be PM again? “The ABC took the cake for moral posturing on Wednesday when the ABC local radio’s Country Hour carried a report saying farmers needed federal subsidies to plant trees on grazing land to provide shade for live- stock… Average temperatures in Australia have risen 0.7 of a degree C since the start of the Twentieth Century”. The average temperature has risen more than that. Besides, no mention of successive hottest years in the C21st, nor of the years of drought. It is just the ABC’s ‘moral posturing’. 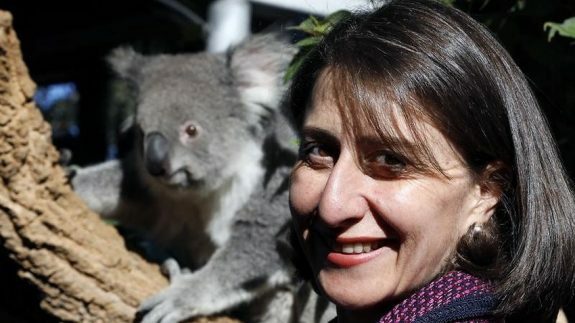 In more recent times, we have seen the failures and falsities of the Coalition’s Green Army program and revelations of massive land clearance in Queensland and NSW. A report in The Conversation (11/3/19), written by a team of authors, tells us that in Queensland in the three years to June 2018, the equivalent of 570,000 Melbourne Cricket Grounds were cleared. That is, 1,138,000 hectares including 284,000 hectares of remnant (old growth) forest. Tree reduction in parts of eastern Australia has increased surface temperatures by up to 2 degrees C.
In the SW corner of Western Australia only 7% of the natural flora still exist. Only 2% of rain forest still exists on the east coast. In Tasmania this summer there have been terrible fires, raising fears for the survival of some specific trees, such as pencil pines. Emeritus Professor Aynsley Kellow has said the trees are “fire adapted”. Other scientists say they are not. Why is there this discrepancy? So we come to Dr Peter Ridd, for example, who has written that coral is the ‘least endangered of any ecosystem to future climate change’. He also tells us that he ‘raises almost all his research funds from the profits of consultancy work which is usually associated with monitoring of marine dredging operations’. Consequently he reports that the Great Barrier Reef is in fine shape and thrives in heat. As well, silt flowing through the Reef has no bad effects. No conflict of interest there? Who pays the piper? He has been director of the Australian Environmental Foundation which has promoted the rejection of human-caused climate change since 2005 (desmog.com/peter-ridd). Meanwhile, as reported on the ABC, scientists at the James Cook University have demonstrated that coral is affected by temperature. One of the scientists went to Hawaii to see how scientists there are breeding hybrid corals to resist heat. Another scientific contradiction. Environment is referred to in a piece by Bella D’Abrera: “Young eco-warriors not taught about how we power democracy”. A by-line says: “Many teachers and lecturers see themselves as agents of change, not instructors” (15/3/2019). D’Abrera is director of the Foundations of Western Civilisation program at the IPA. We recognise here the ideas of Lomborg and those economists who are intent on business-as-usual. It seems to derive from the Biblical idea of humans being given dominion over the Earth. It also reveals why school curriculum Studies of Society and Environment (SOSE) was so vilified by the right-wing media. The environment for them is there to be bought and sold for the benefit of infinite growth and wealth. If there are increases in global warming, it is too expensive to do anything about it and humans must simply endure it to survive. We might ask, then: What is the cost of cooking the planet? What are the consequences of not acting sufficiently to Climate Change? So how do all these ideas play out in the thinking of readers of right-wing media? Following are some Letter to the Editor written by readers echoing the articles on Climate Change appearing in the newspaper. (1) This letter is about CO2 emissions from volcanoes based on a statement from the US Geological Survey in the newspaper. The writer asks: “If the emissions from volcanoes never causes global warming then logic would say that man-made CO2 emissions also never cause global warming”. Looking at articles published by the Survey, I could not find the quotation referred to. But Climate.gov. response to the question, Which emits more CO2: volcanoes or human activities? says: “In fact, several individual US states emit more CO2 in a year than all the volcanoes on the planet combined do’. The falsehood is in the question. Eggleton points out: ‘All the CO2 in the atmosphere contributes to the establishment of the basic global temperature level…’ not just some of it  That is, a global level of14 degrees C . Plimer refuses to acknowledge that natural CO2 at 280 ppm has maintained that basic global temperature level for at least the past 10,000 years . Many deniers refuse to admit this role for CO2. If volcano CO2 emissions were to match the human emissions, they would have to emit at 30X their current annual rate . Currently, the CO2 level in the atmosphere is 410 ppm, the highest level of carbon dioxide for at least the past 24 million years . “At present the world is warming at the rate of 1 degree C in 60 years; that is, 20 times faster than any previous sustained rate of temperature change . No point in trying to equate past climate changes with the current climate change. They do not equate. We need to look carefully at figures used in newspapers. The article referred to by the correspondent claims volcanoes emit at the rate of 600 million tonnes per year. Eggleton says 300 million tonnes per year on average . (2) This letter comments on a claim by the CSIRO that “recent warming can only be explained by human interference”. The reply given by the correspondent is that the climate has changed for millennia, but he does not seem to understand that reasons for change are not always the same. The response goes on the say that the level of CO2 in the atmosphere is only 0.04% – and this is supposed to be the reason why it could not possibly cause global warming even if it were to be doubled or tripled. That is, it is capable of supporting life on Earth, but like Plimer, the writer refuses to acknowledge the part played by CO2 at 280ppm in also keeping the average Earth temperature at 14 degrees C .
(3) This letter attacks the ABC for showing film of ice breaking off into the sea, bushfires, storms and floods. These are events which have occurred before, it is claimed, but there is no explanation about to what degree. (People are saying across the world that they have never seen anything like it.) But he wants the ABC to show how “higher levels of CO2 do not drive up the temperature. In fact, the reverse is true”. So are we to believe that in fact the Earth is cooling, despite the recent years being the hottest recorded? The idea of more CO2 having less effect is very much like Carter’s claim. But the CO2 does have an effect as more is emitted into the atmosphere. “Doubling the amount of CO2 or water vapour does not double the heat absorption; fortunately, it increases it by only about 30 percent” . It does increase the heat, not the reverse. It is still a heating effect and not a cooling. So the writer goes to solar activity and releasing CO2 from the oceans. But if CO2 has nothing to do with global warming, why claim the release of CO2 into the atmosphere? We know that by far the greater influential CO2 is that produced by the burning of fossil fuels. And we can see the extent of that kind of CO2 in the isotopes of carbon found in the atmosphere . If by solar activity the writer is also referring to sunspots, Eggleton tells us: ”…Judith Lean of the US Naval research Laboratory concluded that the 11-year sunspot cycle causes a temperature fluctuation of about 0.1 degree C, and that since 1850 a gradual overall increase in the Sun’s irradiance has added perhaps another 0.1 degree C to the global temperature” [34-35]. Maurice Newman, take note. (4) This letter asks how Australia can go it alone in influencing the climate. He says we cannot afford it. This is of course the argument of Lomborg and a number of people who are adherents to fossil fuels. The truth is that we do not have to ‘go it alone’. That is the purpose of agreements such as Paris. It is why we have the United Nations. The big question to ask the author is: What is the cost of not reducing emissions? There are risks to health, climate, water and food security. Reading such a list of problems reminds us of the details associated with the smoking of tobacco. So we have numerous individual people and organisations warning us of the dangers of carbon dioxide (and methane) emissions. The IPCC. The Bureau of Meteorology, the CSIRO to name a few. Sir David Attenborough, individual scientists such as Tim Flannery, writers and intellectual such as Judith Wright, Richard Flanagan, John Kinsella and Tim Winton lament the ravages of human activity on the environment. Numerous fine Indigenous writers lament the destruction of country. Even a farm worker poet, John Shaw Neilson (1872-1942) noticed the loss of birdsong as trees were cleared in the Mallee region. Too many to name: poets, politicians, scientists, farmers, journalists, ordinary citizens. I remember years ago reading the work of William Blake and the ‘dark satanic mills’. And of William Wordsworth’s ‘getting and spending we lay waste our powers’. More recently, there have been legal judgements made, such as the NSW Land and Environment Court decision blocking the Rocky Hill mine in the Hunter Valley region (Feb, 2019). Or the US judgement blocking mining in Wyoming for not quantifying climate change impacts of oil and gas leasing. Naomi Klein and Noam Chomski have written extensively. The IPPC has written lengthy reports. So much information and opinion available. Yet the Murdoch media (“For the informed reader”, self-ascribed “Brand of the year”) and other media outlets, as well as independent denier sites, espouse their own home-made thought bubbles or repeat snippets they hear at the bbq or front bar – but have no scientific basis. Too often judgement is blurred by vested interests. And some of those are very rich. Take for example Rupert Murdoch’s involvement in Genie Energy, which makes claim to fracking shale oil in the Israel-occupied Golan Heights in Syrian territory taken by Israel in 1967. “Covering and distributing news has been my life’s work,” said Mr Murdoch . “If Genie’s effort to develop shale oil is successful, as I believe it will be, then the news we’ll report in the coming decades will reflect a more prosperous, more democratic, and more secure world.” (source: nationofchange.org, 2017/01/15). Yes, yes. Great news for the world! Great news about climate change, great news about fracking for oil in occupied territory. And I have not even mentioned the all-pervasive and destructive presence of plastics, a petro-chemical product. The federal LNP wants the national election to become an ideological auction about the merits of its prescription for market ideology with its unaffordable housing, homelessness and falling real wages. Ironically, for the professional ideologies in the federal LNP, there is scant attention to trends in private sector investment which should be the forte of outstanding centre-right leaders worldwide. Landry, who is the member for Capricornia, told the ABC on Wednesday she was not in control of her campaign finances, so she wasn’t in a position to nominate a specific figure for Adani donations. She said taking financial support from a company trying to secure federal and state backing for the project “certainly doesn’t sway me”. 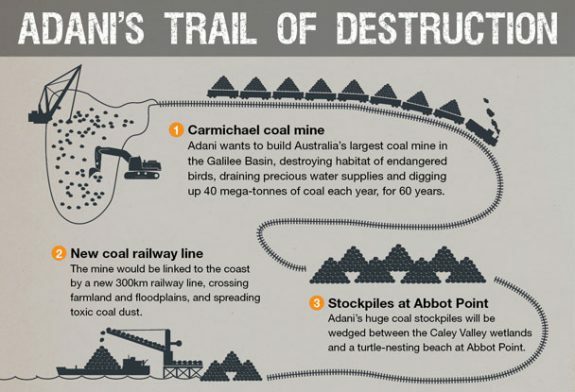 “My main job is to look after the people of Capricornia, and [the Adani project] is about jobs for the people of Capricornia,” the Queensland MP said. “I have the biggest coal mining electorate in this nation, and I stand up for my people here and will continue to do that”. Josh Frydenberg wanted to dazzle the electorate with hopes of a $7.1 billion surplus for the financial year ahead in his budget delivery speech. 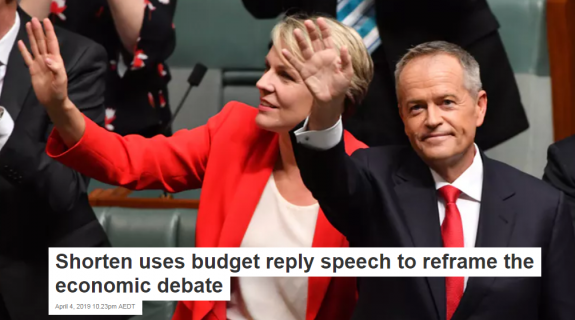 Then came the welcome distraction posed by Bill Shorten’s response to a reporter’s question about Labor’s long-standing superannuation contribution tax concessions for incomes above $200,000 (ABC News Online 16 April 2019). This is very old school political debate as apologists for the current market economy wait for the next El Dorado to replace the resources and property market booms while keeping tabs on opposition leaders under pressure without the resources available to a government in office in caretaker mode. Balanced private sector investment to promote economic diversification is no art-form in current government policies. Completely overlooked in the federal LNP’s rhetoric about that Stronger Economy are the languishing trends in private capital expenditure which accounts for 75-80 per cent of all investment in the Australian economy. In the private sector, investment trends have plateaued since the election of the federal LNP in 2013 with an anomalous improvement in the December Quarter data for 2018-19. This will be the last set of private capital expenditure data to be released before the forthcoming election. Capital expenditure in the Australian economy has lagged since the federal LNP was narrowly re-elected in 2016 as shown by the plateauing out of the longer-term trend-line of private sector capital expenditure. Only the last December Quarter in the series offered a good seasonally adjusted result due largely to a vast improvement in expenditure on plant and equipment associated with inducements to tax write-offs which commenced in the 2018 budget and were continued this year with bipartisan support. The federal LNP’s blind-spots on the need for policies to foster economic diversification continues in the budget. Investment was mentioned six times in the budget delivery speech. Each time it was about the need for prudent government investment with overall government spending below 23.9 per cent of GDP to 2029-30. Amidst all this rhetoric about containing government spending little attention was given to the trend-lines for Australian Capital Expenditure which should be the forte of any conservative government. The latest global data from the McKinsey Global Institute (19 January 2019) shows the importance of these new forwardly looking investment strategies for application in a middle-sized economy like ours. Best practice in the application of the McKinsey Model occurs in the Scandinavian style of social market economies which achieve bipartisan support from the mainstream political parties. As Australians are not ready to accept such high levels of taxation and government intervention to implement the McKinsey prescription for economic diversification, our future must lie in taxing every opportunity of available investment from the global market economy. Missed Opportunities for the Consolidation of Net Capital Inflows to Australia from Asia have not been assisted by the federal LNP’s deference to policy directions from the Trump Administration with its America First focus. This makes Australia a client state in key areas of economic diversification. Co-operation between Financial Consultants KMPG and the University of Sydney can offer new strategies for a progressive incoming Australian Government with real initiatives to break with the old economic jargon from the federal LNP. The full report from KMPG is available online. While China is repairing its financial relationships with immediate neighbours like Japan, South Korea and Taiwan its financial relationships with the Indo Pacific Basin are being extended by Belt and Road initiatives in the important areas of higher technology investment and financial services which are crucial to the Australian economy. 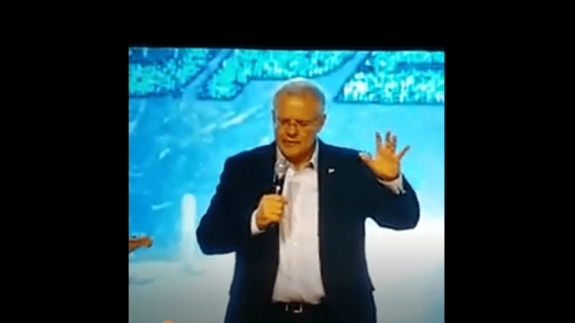 New horizons present themselves for Australia if the federal LNP does not spook the electorate before 18 May 2019 with the quest for the market El Dorado to replace the resources and property boom with a new age of mass consumption for the aspirational side of town in the hope that the benefits of new tax packages might be passed down the line. Despite the regressive certainty of our federal LNP leaders, a new investment direction is available that is quite mainstream in its assumptions about the opportunities for stabilising change. 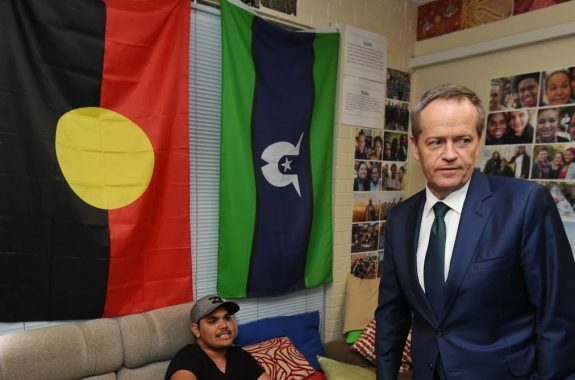 Like President Roosevelt of old, Bill Shorten can hopefully calm the fear strategies from the LNP’s most eloquent fear strategists to upset the leadership transition after 18 May 2019. Will theme music be developed for application to Australia’s successful social market transitions at the 2022 elections? Denis Bright is a member of the Media, Entertainment and Arts Alliance (MEAA). Denis has qualifications in journalism, public policy and international relations. He is committed to citizens’ journalism by promoting discussion of topical issues from a critical structuralist perspective with support from evidence-based data. Readers are encouraged to continue discussion on the issues raised. Comments from financial, academic and political insiders with access to a better range of resources. Some farcical but thrilling road-blocks were encountered in attempts to extend this article through phone calls and emails relating to private sector investment trends. Treasury is best placed to respond to your questions and will do so. Can everyone conclude that the federal LNP is flying without radar in tracking projected private sector investment trends? I don’t belief that this is true so let’s wait for the ABS data from future quarters which the mainstream press has chosen to ignore in the past. Will they ever learn? After watching the first Question Time of the most recent sitting of the House of Representatives, the only plausible answer to that question is a resounding NO. On April 2, parliament resumed after a brief recess to enable the Budget for the next year to be tabled, a necessary prelude to the PM calling an election. 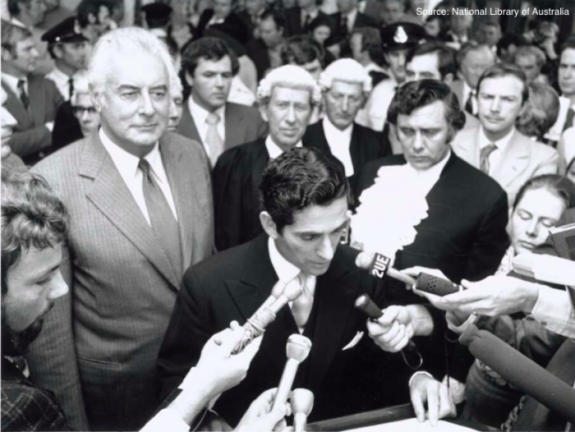 It began with motions of condolence before getting down to the real business of parliament, the unseemly brawling that characterises our federal politics day after distressing day. It was heartening though to experience what our politicians are capable of being. Their condolence speeches were well-written and sincerely and stylishly delivered by the PM and the Opposition Leader. They acknowledged the tragedy of the Christchurch massacre, the death of Dr John Herron, surgeon and longtime Liberal Senator, whose humanitarian work in war-ravaged Rwanda is legend, and the death of Les Carlyon, accomplished war historian and sports commentator. It was a professional exhibition of good manners, courtesy and collaboration across the aisle. It was warming, albeit surprising to see our politicians acting with mutual consideration, each acknowledging the fine words of the other. As a long time detractor of the political class, I asked myself why could it not be like this always. Could courtesy become the norm? No sooner had the pleasantries finished and the condolence motions formally referred to the Federation Chamber for further consideration, than Chris Bowen asked the first of the ‘Questions without Notice’. Regrettably, it was an angry question aggressively directed to PM Morrison. 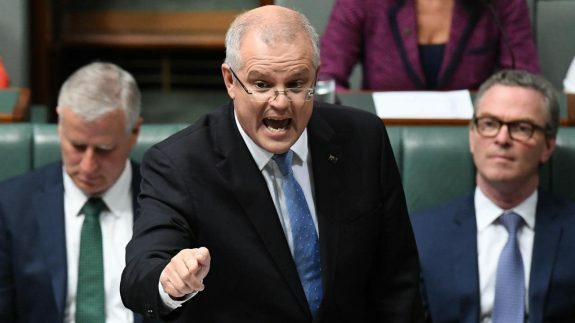 Entirely predictably, it evoked the ill-tempered, archetypical response from the always-ready-to-scrap Morrison. Shouting from lips quivering with rage, he assailed his opponents with a torrent of angry words. Good manners were abandoned. The brawling resumed. It will continue unabated until the House assembles again after the election. Why do politicians behave this way? We know that aggressive behaviour is not confined to males. Listen on Fridays to Jon Faine’s The Wrap on ABC Melbourne Radio, a weekly summation of federal politics. There you will hear his panel of women screeching at one another. Reflect on Michaelia Cash’s raucous rant during Senate Estimates when she snarled at accusations of improper actions in her department and threatened retribution, and again recently when, addressing a cluster of tradies after Labor announced its electric car policy, she thunderously declared: ‘Labor is coming after your utes’, forcing you to drive electric vehicles. Although we know that aggressiveness is not restricted to males, even male chauvinists would concede though that males have longstanding form on this sort of behaviour. Is there an explanation? Having roundly criticised the behaviour of senior politicians during that appalling episode of Question Time, I ask myself: ‘Why is it so?’ Coincidentally, as I was writing this piece, there was an episode of the ABC’s The Drum titled ’Men’s Special’ hosted by John Barron, which featured a panel of experts who discussed the behaviour of men in great detail. The insights they provided revealed the thought processes of a variety of males, young and old alike: their fears, their apprehensions, their hopes, and their ambitions. Although the programme runs for an hour, it is well worth a view. It gives more insight than I ever could into why men behave the way they often do. So I conclude this short piece with that episode from the ABC’s The Drum ’Men’s Special’. It speaks for itself, illustrating as it does the violent behaviour that men are capable of displaying. I rest my case. Click here then play the Men’s Special episode, which appears at the top of the page. You may not wish to play the whole of it; the first few minutes will give you the gist of it. On Manus Island there are three camps that are run by PNG immigration and Australian Border Force. 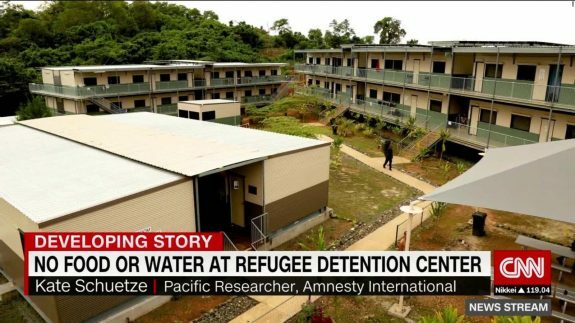 East Lorengau Transit Centre and West Lorengau Transit Centre are for people recognised as refugees through the flawed PNG/Australian refugee assessment process. The third is called Hillside camp. It is where those who have been deemed non-refugees, for various reasons, are held. East Lorengau Transit Centre is fully contracted to a company called Paladin which provides security, maintenance and food. West Lorengau Transit Centre and Hillside camps have different service providers. Paladin provides security and a local company called NKW Holdings, provides food. Those transferees who live within the East and West Transit Centres are provided with raw food and have self-catering kitchens to cook themselves. Those deemed non refugees who live in Hillside camp are served cooked food by NKW. Asylum seekers in Hillside camp on Manus are seriously suffering with hopelessness and desperation. Management is now adding more stress and weakening them by reducing the amount of food they receive. Most of the men go to bed hungry because they have not been given enough to eat. This is further crushing on top of all of us being treated like criminals, our very basic human rights actively ignored. We ask: What is our fault or what was our crime? Why are we being treated like this? When the guys ask for an extra piece of meat or one cup of rice the guys are being humiliated and refused. The contractors care only about money. They put all the funds that are given to spend for refugees in their own pockets. After almost six years refugees here are still made to suffer unbearably. This is really, really ridiculous and a cruel crime. The man who killed 50 people in New Zealand complains about his lack of rights. But here we are having committed no crime and yet we are treated like the worst criminals. All decent Australian should raise their voices against this injustice that is being done in your name, paid for with your taxes, which are wasted, spent to torture innocent vulnerable people who came to your country to seek protection. Please speak up for us now. Please make our voices heard. Please use your voices to support ours. Speak now or you may be the next to suffer. What is done to us will be done to you next. Wake up, Australia. Shamindan Kanapathi is a Sri Lankan Tamil man and refugee. He has been detained by Australia on Manus for almost 6 years. Over a number of years he has been reporting from within the camp through social media. His hopes have been that some day he will be free and reunited with his family; be able to help to raise the voices of those who are not heard; to care for those who are not cared for; and pursue his dream of becoming a veterinarian. While Shakespeare may have ‘popularised’ the term, the ‘ides of March’ goes back to Roman times when March was the beginning of the year (giving the excuse for celebration and prayers that the new year would be prosperous) until 55 days were added in 46BC. Two years later ‘dictator for life’ Julius Caesar was stabbed to death — linking March with turmoil forever after. March opened with (depending on your point of view) either a technical recession or very small increases in the growth figures released as a part of the national accounts. Regardless of your point of view, wages are generally perceived to be growing at a lower rate than prices, fees and charges. In addition, Treasury blew the whistle on the government for misrepresenting the ALP’s proposal for changes to negative gearing policy, should they win the next election. Along with everyone else, The Political Sword has made comparisons between the reactions and subsequent observations on the Christchurch terrorism event in Australia and New Zealand. And while Teena McQueen (an apparently ultra conservative factional warrior and National Vice President of the Liberal Party) did make the valid point on the ABC-TV’s Q&A broadcast on March 26 that New Zealand is effectively copying Australian laws introduced in 1996 by former Prime Minister Howard after the Port Arthur massacre, the rest of McQueen’s performance was in the opinion of Nine Media’s Neil McMahon Train wreck TV. McQueen tried to diminish Ardern’s credibility by suggesting that her government is a coalition with Winston Peter’s NZ First party. True, it is, and Peters has run an anti-immigration line at times — but the Morrison government (whose party has also consistently run an anti-immigration line for 25 years or so) is the result of a long-term coalition with the National Party. Most countries around the world have to some extent a coalition of political views in their respective governments. Apart from showing that ideology without knowledge or understanding is a dangerous thing, her point is …? 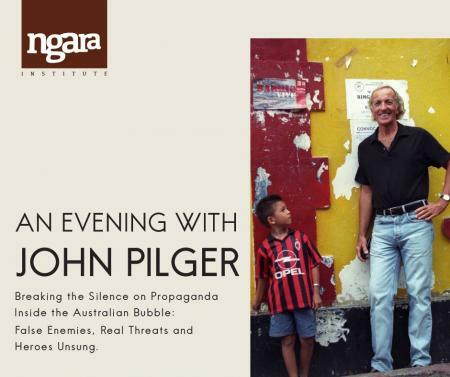 The same week as Endgame was published and McQueen appeared on Q&A, ABC-TV broadcast Al Jazeera’s ‘How to sell a massacre’, detailing a ‘sting’ operation on the USA’s National Rifle Association (NRA) using two ‘officials’ from Australia’s One Nation. It’s easy to believe that originally the ruse did not involve One Nation, but the producers were happy that the Party was gullible enough to accidentally participate. During the program, a number of statements were made by the One Nation officials that indicated that they were in favour of relaxing gun laws and repeated white supremacist hate-based rhetoric. Political parties in general need to remember that while they can ‘recommend’, ‘suggest’ or even ‘encourage you strongly’ to follow the order of preferences determined by the respective head offices or campaign headquarters, they only ‘control’ or ‘direct’ the preferences when you vote above the line on the Senate paper. So while Morrison got into all sorts of bother sitting on the fence yet again, he could have finished the ‘discussion’ over One Nation’s apparent love of guns and white supremacy in a day by suggesting that the Liberal Party will put One Nation last on the Senate ‘above the line’ preferences and that voters do the same when they have to decide preferences. Morrison can’t speak for the Nationals or the LNP in Queensland as they are separate Parties (that don’t have to follow your direction Teena), the same problem McQueen claimed demonstrated a lack of credibility of the Labour/NZ First Coalition in New Zealand.